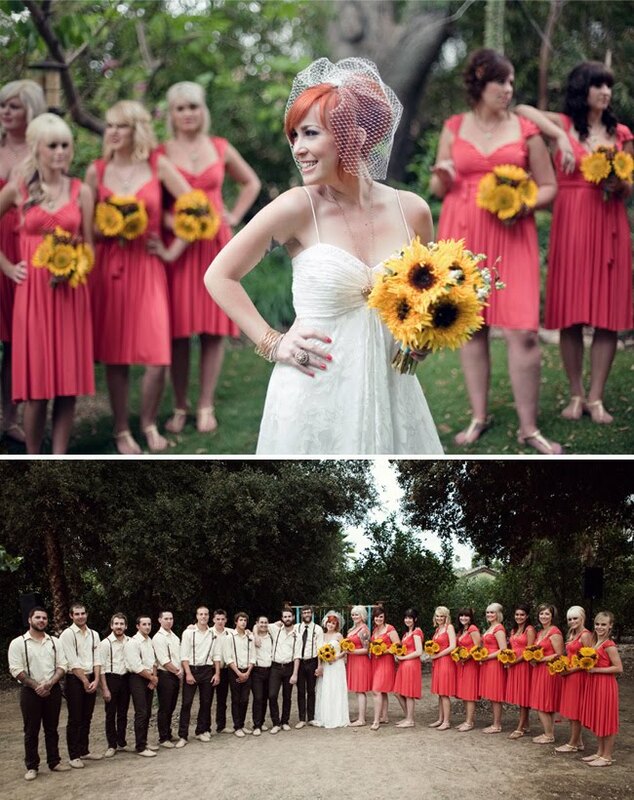 Amanda from In the Now Weddings sent me the lovely wedding of her assistant Shannon. Shannon got married this past summer at her grandparent’s ranch in Corona, CA. 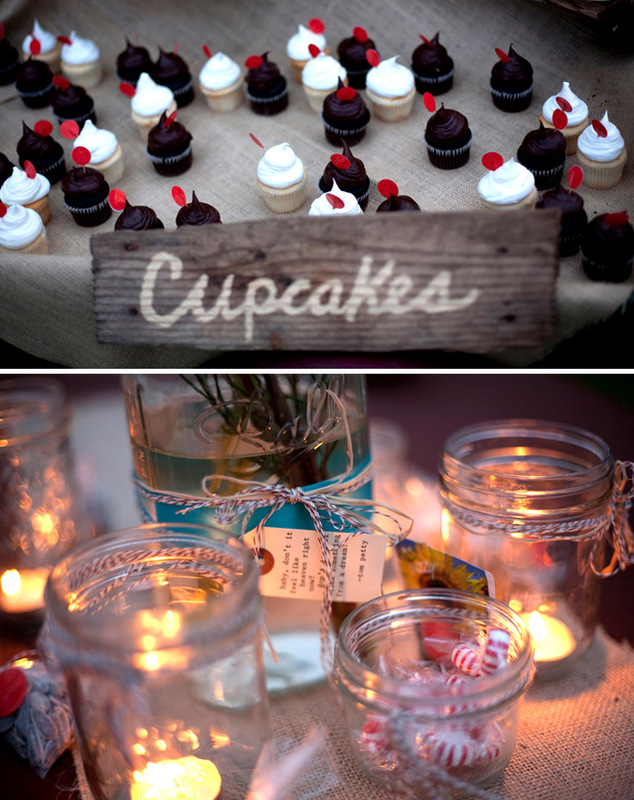 She and her husband are super stylish and they had such a fun homespun affair. I really love the contrast of the vintage groomsmen attire paired with the bright pink dresses on the girls. Beautiful photography by Bryan Sheffield. Not usually a fun of sunflowers, but love them here! More pomegranate trees! I think I’m going to plant one in my backyard – they are so pretty! How we met: We met when my brother’s best friend, Andy, brought Scott down to see me from school. Andy insisted that we would be totally into each other and that he could see us together. We both took that with a grain of salt, seeing that others had said that to us before. We hung out a few times after that and saw what Andy meant! Just a couple of months after our initial meeting and a few days after being officially a couple, I moved up to Seattle. Talk about timing! We grew closer over the phone and Scott eventually moved up to Seattle for the summer where we spent every day together. The rest is history! We got engaged around Christmas time on vacation in Hawaii with my family. How incredible. Planning: Working with Amanda and In The Now gave me a spring board to make my wedding exactly what i wanted it to be like. I was able to get loads of feedback and tons of positive ideas and resources to get inspired from. It also gave me the confidence to make decisions and be equally creative through the past work I’ve done with In The Now. Favorite memory: I’d have to say my favorite memory of the day was actually the WHOLE day, obviously. But two moments always stick out: the ceremony and our grand entrance at the reception. The ceremony was absolute perfection – it was so personal, so powerful, and so beautiful. Our grand entrance was just as special. We were introduced as husband and wife, with one of our favorite Tom Petty songs blasting in the background and the cheers of all our loved ones. It was incredible to have our two sides together for the first time celebrating with us, and boy did they know how to celebrate. The wedding was incredible and special. I want to relive it every day! Advice: My advice for planning a wedding is to enjoy it. Enjoy your fiance, enjoy looking at venues, enjoy planning the details, enjoy making your favors, enjoy everything. It will pass by SO quickly, so grasp as much as you can! Also, have fun with making it a reflection of you – express yourself and give your guests the best experience that represents you two as a couple. I love the addition of the gun and the animal in that shot! 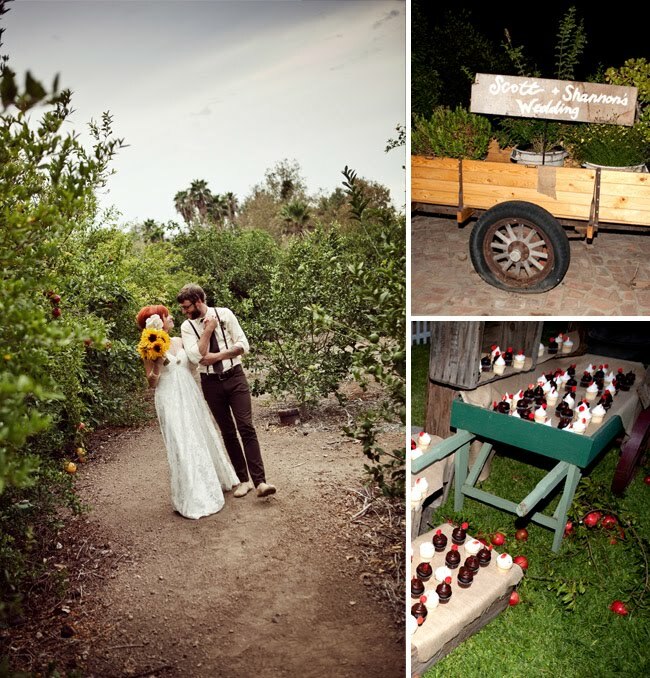 LOVE this wedding's style! so beautiful… which seems to be per usual for those InTheNow gals. Hi! I love your beautiful blog! Just wonder… Can I borrow some of your pictures to make a collection of my favorites, and put it on my blog? I will ofcourse link you back. You can answer here :) I'll check in later. BTW: My English is bad, sorry! I love your blog, there are so many inspirational photos and ideas on here! AH! I live in Corona as well (near Tasteful Cakes and Mi Tortilla in fact) and I've always wanted a sweet wedding like this. 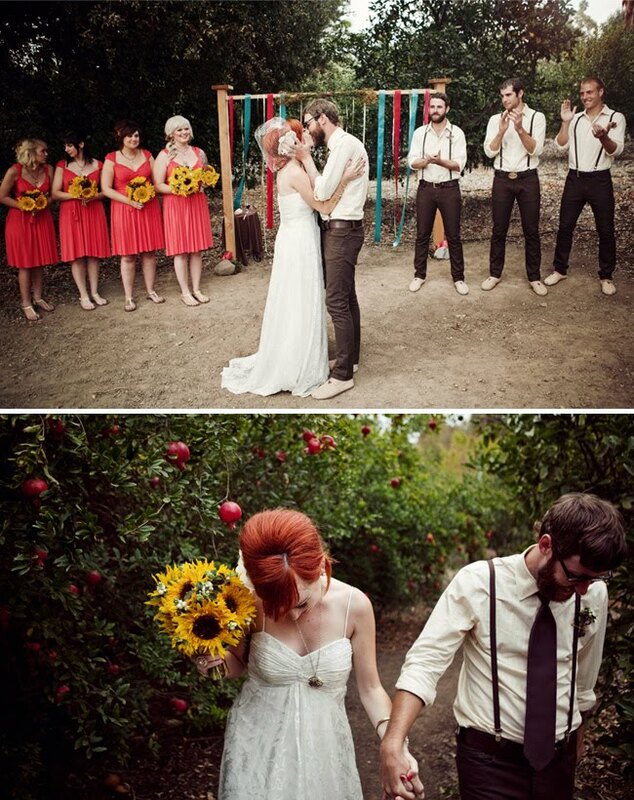 This totally shows how inexpensive but BEAUTIFUL a wedding I can have one day. :) And this couple is too adorable. Hopefully I get to run into them one day and tell him how amazing their wedding looks! LOVE IT Amanda!! way to rock it out girl… and love it JEN you always post the best stuff. 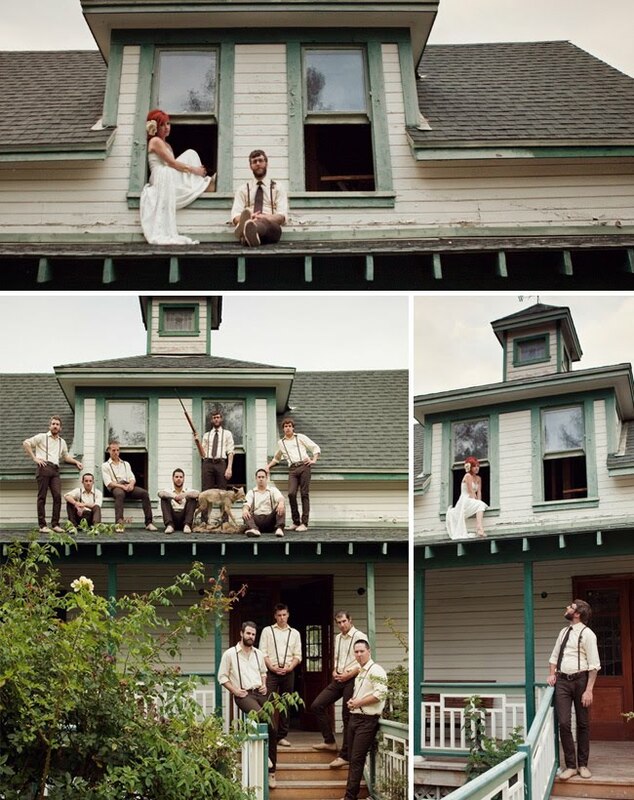 I love the creative photography, the wedding party on the roof is fabulous! Great flowers too! Awe- YAY for all the love of Shanny!! We totally adored being a part of her engagement. And yep, she's a pretty hot one! Makes me want to dye my hair red! Awwww this is so cute. I love the pics on the roof, very quirky. Kyaaaaaaaaaaaaaaa!!! Love it! I always love this side, this blog. Very creative. I can't wait 'till your new creative photography and next wedding. LoL! I Just LOVE her hair color! Beautiful wedding, great bright color scheme! Great Photos! One of the most original weddings I've seen in a long time! And I've seen my share of weddings! Love the suspenders!! Great post. 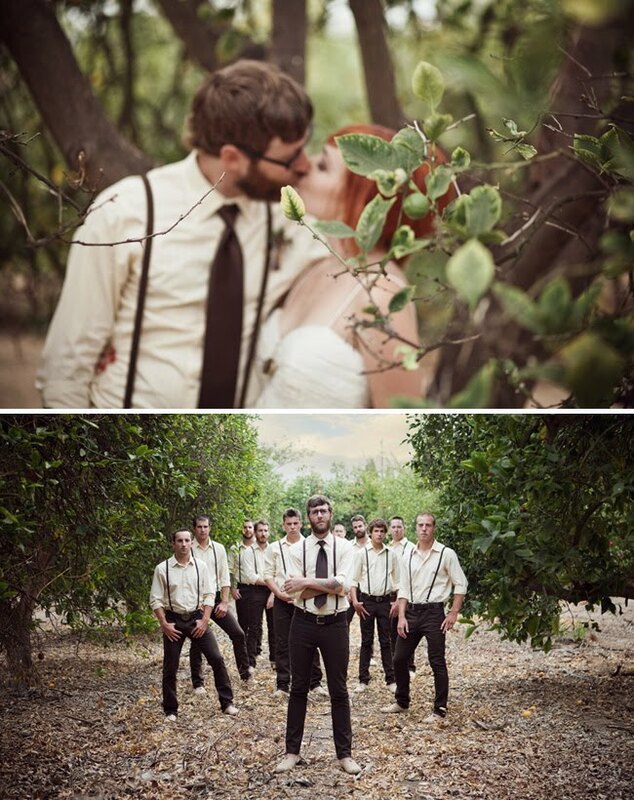 Hey, this is such a marvelous and fun wedding.The groomsmen wearing suspenders look so adorably cute and cuddly…lol! 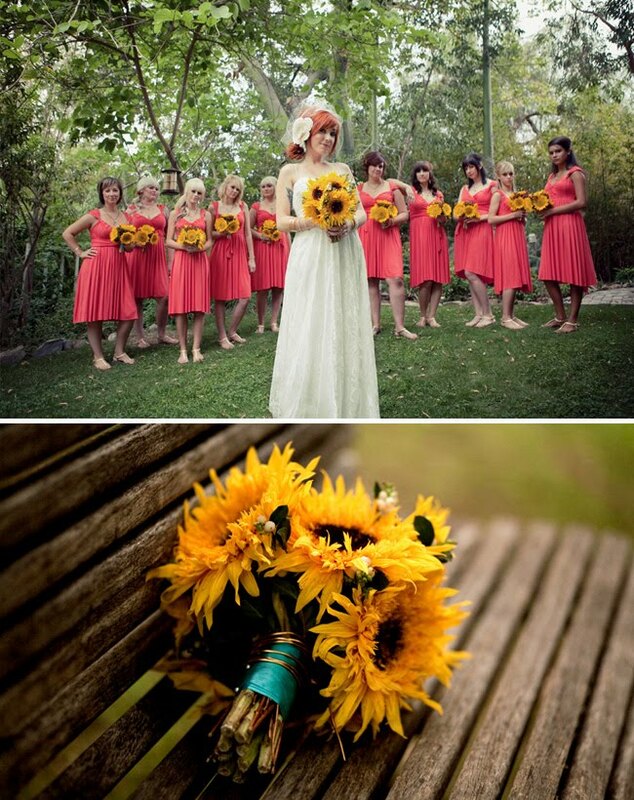 How original and unique.While the bridesmaids look pretty and bright in their eye-catching dresses matching the bright yellow sunflower bouquets. What a wonderful wedding!!! Fabulous simple yet it states soo much! I love the suspenders! I love the shot of the guys on the roof! This wedding looks like pure fun. I love the colors. Omygosh, everything about this wedding is amazing!! I love the style of the photos, the bride and bridesmaids…I love every bit of the details!! these pictures were such fun to look at…love the spontaneity in the pictures! really amazing pictures, especially those on the roof. Beautiful wedding.